In HTML, the lingua franca (a new phrase I learned the other day!) for most things related to how things look is CSS. Before diving into CSS and looking at how it can be used, let's start at the very top and simply define the various parts of text and brackets that make up a CSS style. The contents that you see are defined in plain HTML. The look of this example (the rounded corners, the colors, the font used, and text size) is entirely defined using CSS syntax. There are other ways you can find styles in your document, but we won't concern ourselves with them right now. What is important is what is contained inside them - the CSS rules. The main components of a CSS style are the individual rules, and it is these rules that have all the impact on how the contents of your documents look. A rule is made up of two components - the selector and the declaration. What this means is that this rule will apply to any element whose type is p. Selectors can be quite simple as what you see here, or they can be quite elaborate and involve combinations of HTML elements, class names, and ID values. A separate tutorial will examine the variety of selectors in greater detail. If you have multiple property-value pairs, which you will commonly have, you can place them either in separate lines (as I've shown in all of my examples), or you can place them in a single line as well. CSS doesn't care as long as each property-value pair is separated by a semi-colon. That's all there is to learning more about the anatomy of CSS. At a high level, you start with a CSS style. 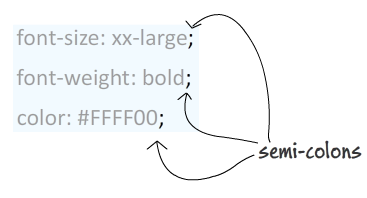 From there, you go into CSS rules which are, in turn, made up of selectors and declarations. A declaration is made up of one ore more property-value pairs that actually contain the appropriate CSS property and the value it contains.